Allow me say Happy Valentines Day! How did you guys celebrate the special day? I and hubby opted to stay home after some appointments lined yesterday and avoided the terrible traffic which happened left and right in the metropolis. A lot of concerts happened and it was like everybody was rushing to go to their dates. While we were in the car on our way home late afternoon, we both laughed while listening to the radio as a lot of jokes were aired by a DJ. Actually, those were advises for those who are in a relationship, complicated, married, and single status. We can't help but laugh especially the advise given to singles. Oh boy, my fellow Pinoys are just so damn good in creating jokes. Anyway, today I am going to share with you a new nail art. I have posted already using this nail polish here but since I really love this blue color, I used it again and came up with a little art. Are you ready for summer? 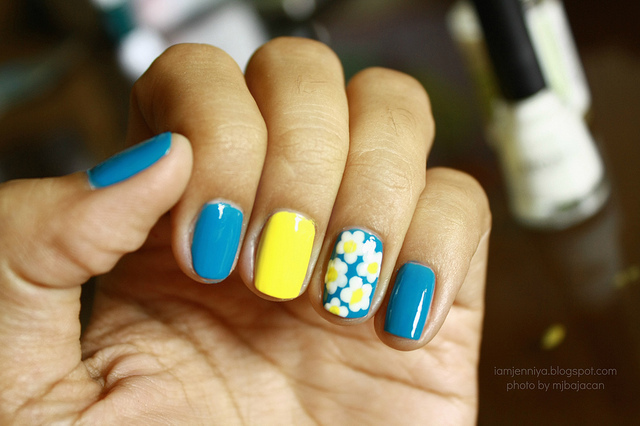 Coz this nail art screams summer, isn't it? Keep reading to know how I did this. Step #1. I used Caronia in Bluberry, Sweet Surprise and White Satin. Step #2. Apply 2 coats of Blueberry onto nails leaving one nail unpainted. It can be either your middle or ring finger. Actually, I painted all my nails with Blueberry but I erased the one in my middle finger after a minute because I suddenly thought of something that will surely make this nail art fun. Step #3. Apply 2 coats of Sweet Surprise onto nail. So, now you see why? Hmm.. Step #4. 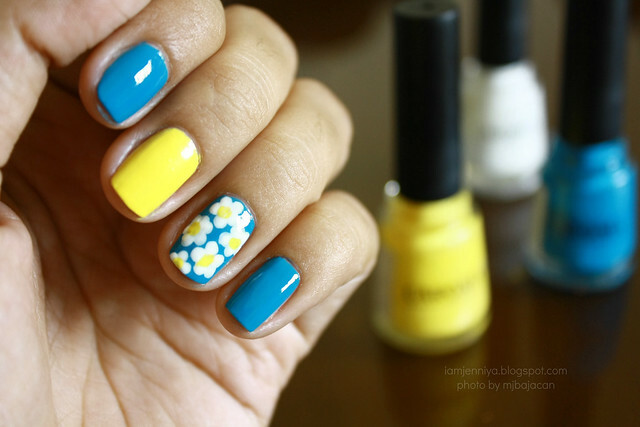 Make flowers onto your nail. Using a dotting tool or a toothpick, dip the tip to White Satin and make 5 dots. It is better to make about 4. Well, it depends if your nail is short, then 3-4 will do but if you have longer nails, you can make 5-6 flowers. Then, dot the Sweet Surprise on the middle of each flower. Step #5. Apply your favorite top coat. 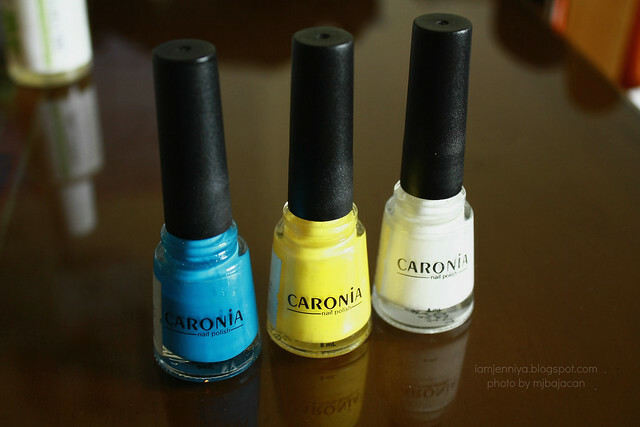 I'm using Caronia Fast-Dry Top Coat to protect my nail art and for much glossy shine. Done! Isn't it very easy and fun to do? I am so ready to welcome the heat! Let me know for any recreation or any similar designs you have done already. I'd love to see it on your nails lovelies! That is really lovely!!! Love the colors and the flowers. omgosh i love this!! 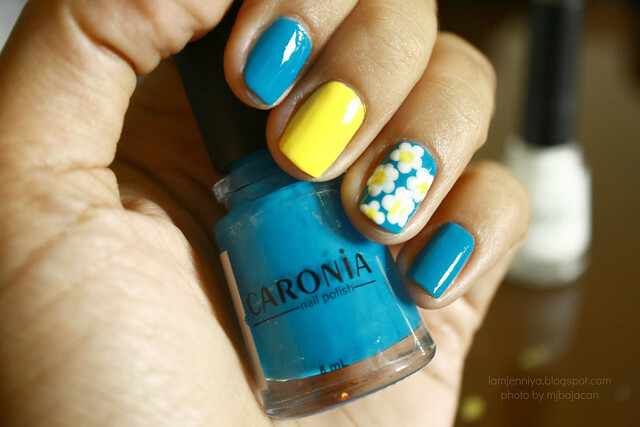 so pretty the blue and the yellow really pop against each other! your flowers are sooooo pretty you're so amazing at nail art! Cute nail art, love it! This is a brilliant creation for the warmer months. OMG that´s so cool and pretty! Love it!!! amazing nails! I can never do pretty flowers. haha! pretty nails! ^-^ wish I could make nail art like that so perfectly ! Cute! No! I'm not ready for spring even! Lol. I didn't do anything valentines day. I do not like it, ha. I love your nails though, I'm going to try something like that when I get my hands on some decent colours! Sure, it's fun to do. I love the colors you chose. Oh sweetie really cute nail design! So pretty! Definitely makes me think of Spring & Summer! omg the nail art is too cute!! you did it by yourself? you're talented! what do you think about following each other on gfc and bloglovin? Beautiful blog! Like this photos! 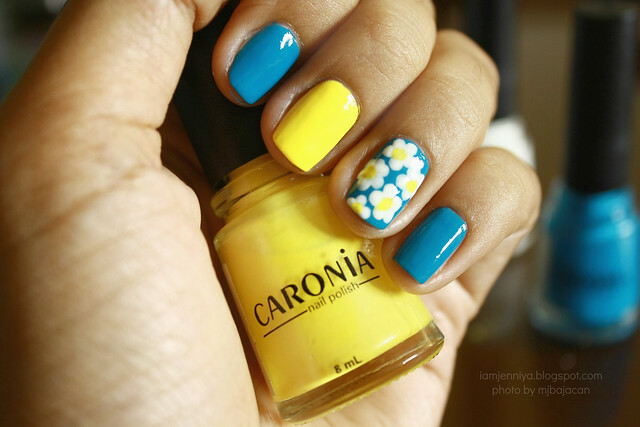 lurvn it, this nail polish def calls for summer. great art. Hi Jenniya, I love this! 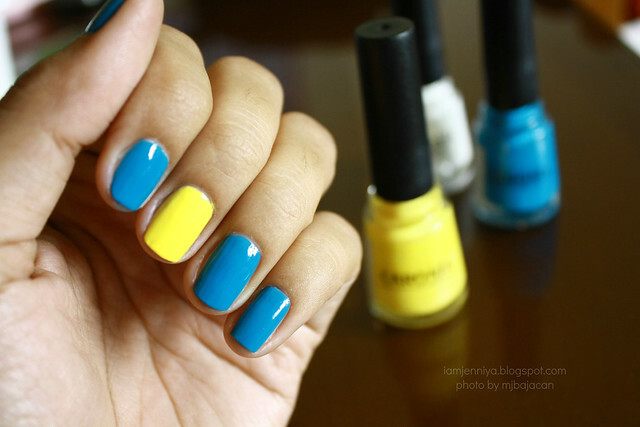 I think I might actually try this during summer--it looks so summery! wow! How did you make the flower thing? Nice nails Jenniya! Thanks for your comment on my blog!!! 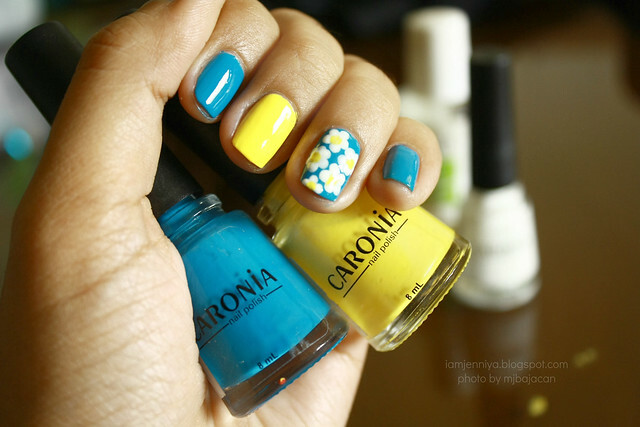 I like your blog so I will definitely follow you, I hope you follow back :) and this manicure looks sooooo cool and summery!!! I would like to try it for sure! !